The iGorot Preacher: What Makes Your Bible Interpretation Right? What Makes Your Bible Interpretation Right? Why are we so confident in our Bible interpretation? What is your confidence level in Bible interpretation? How convinced are you in your theological understanding and interpretation of Biblical truths? What makes your interpretation of the Bible correct? Why are we so convinced and confident that our interpretation of the Bible is right and others' is faulty? Who granted us this rights of correctness while everyone is at fault? Look at the the Arminianism and Calvinism debate or the cessationism and continuationism debate. Both sides of the camp are fully convinced that they are right and the other is wrong. 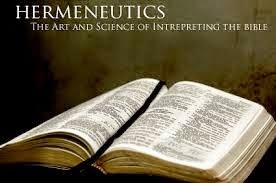 When I studied hermeneutics, I learned some principles of Bible interpretation. While they are good guidelines of interpreting the Bible, I am sure they are not absolute. One of the principles I learned is that we cannot teach doctrine or lesson from the Bible narratives. The narratives are simply stories and therefore we cannot teach doctrine or derive lessons from them. The Gospel and the book of Acts for example are labeled as narrative. Because the book of Acts is purely narrative, we cannot teach doctrine out of it or copy what they did. This principle of interpretation is good in way that it guards us from abusing the Bible narratives. Yet, what if that is not what God intends? What if we can derived lessons from the narrative for us today as long as it does not contradicts the Bible? One thing is certain, the authors of the books on hermeneutics did not receive any special revelation from God regarding the principles they suggests. The principles are guidelines only but the are not absolute because they are man-made principles and not direct commands from the Scripture. Let me end here by leaving you this question. What if understanding the Bible is not about the use of intellectual prowess but the condition and attitude of the heart?